HHi ! Yeah, I’m super happy to go back to Prague, I like that city a lot and both of the events I went to there (EYYC and Worlds) were amazing! Well, I’m looking forward to meet new people and old friends; it’s crazy to see how many people are coming this year at that contest! I also can’t wait to watch the freestyles of the contests because they’ll be awesome in the national divisions like in the open ones. By the way, these small contests are like practice for me because I learn how to manage my stress and I can try some new tricks in front of the audience, so I learn a lot for big contest when I try freestyles at contest like Czech nats. But of course I also come to have fun as always. Sure! I’m going to compete in 4A and 1A open. I’m going to use the YoYoJam Transcend (Tessa Piccillo’s yoyo) which is my current favorite one for 1A and the new YoYoJam Fiesta Très in 4A. My life here is great right now. It’s holidays in France and I don’t have so much homework to do, so I just practice (yo-yoing or other skills) and go out a lot to party with friends^^. Moreover, I’m traveling quite a lot: I went to Bulgarian national last month, to Spanish national last weekend and will be back in Prague very soon. Well, there are a lot of yoyo players I love to watch and I take inspiration from a lot of them, but if I have to say the name of one I would say Rei Iwakura. He’s my favourite yoyo player of all time, for his yo-yoing in every style but also for the other skill toys he can perform with and for the so professional stage attitude he has. It’s hard to say this time. I think Vashek Kroutil can take back the title, I judged him at French national when he won the open division and his freestyle was quite amazing. But Kuba Dekan is still the best one for the clickers in my opinion, and he always go clean. And we can’t forget Petr Kavka who is one of my favourite and who did great at Spanish nats. I think Kuba, Petr and Vashek will be the top 3, but I can’t say the order. Matous Tomes, Tomas Bubak and Robert Kucera are also some of the best to me, but I think they’ll not be in top 3 this time. But that’s really hard to say for all of them, it depends on the mistakes of everyone and the score will probably be very close. “Back to the Future”. Like a lot of people, I watched them last Wednesday because the protagonists visit the future on the 2015 October 21st, we did that with friends and that was very fun. I like that movie a lot. Congrats for your third place in 1A and first place in Xdivision at French nats! We heard you are doing yoyo demos, how is it going? Thank you. I was quite disappointed about my 1A freestyle, I’m not sure I deserve that place, I did a lot of small mistakes and I was very nervous. My X-div freestyle was better but you know, there is no true competition in X-division in France. Yes that’s correct, I’m sometimes doing demo, or I prefer to call them shows. Because it’s not only about showing people what’s yoyo truly is (even if it’s part of my goals), it’s also to make the most professional show possible for an audience and get money with that. 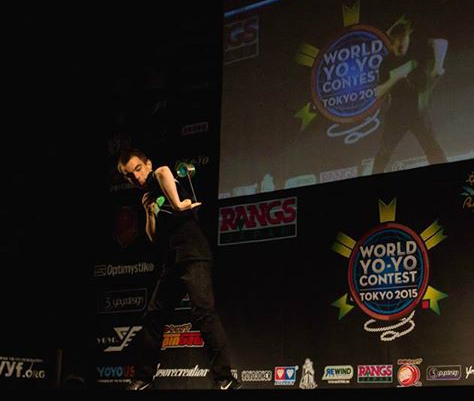 It’s one of my dreams to live as an artist, making show with yoyo, contact juggling and the other things I can do. I don’t know yet if that dream is realisable, and I definitely don’t have enough money with it yet to have that as a job but that gives me enough to travel, which is a good beginning. I’m studying computer science in the same time so I have a security if I can’t make it in the artistic area. It depends, both can be beautiful. But I can tell you something for sure: I love yoyogirls.